We made a G for GABE!! This doggie birthday cake, is a family original. Every recipe I found, was a little strange, with all sorts of weird ingredients. So, we made up our own recipe, by using a basic white cake recipe, but we subtracted and added some things. And to our surprise it turned out amazing....well our Dog thought so anyway! The ingredients make a small round 6 inch cake! If you are treating more than one dog, feel free to double or even triple the recipe. 1 13oz can of wet GROUND dog food. Divided! Beat together sugar and butter. Add egg! Add half can of wet ground dog food. And mix well. While cake is baking, cook bacon. Stir the rest of the dog food, to soften! When cake is done, remove from pan and let cool. 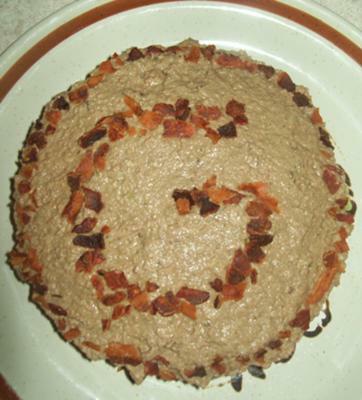 Frost with remaining dog food and decorate with bacon.